If you’re considering creating a scholarship program, here’s one way to start thinking of the design: if I put a chair in front of you and asked who was sitting in the chair as you design your program, who occupies that chair? 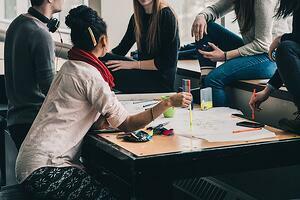 Is it your donor, a community member, a board member—or is it the student? Are you asking questions such as what does the donor want, or what does the board want? Or are you asking who are the students in my community, and what do they need to be successful? Designing a scholarship program takes real, thoughtful work to ensure it meets the needs of your community and its students. In this three-part series, we’ll look into the big questions you need to ask, and the process you’ll need to go through, to deliver a scholarship program with purpose. In upcoming posts, we’ll take a close look at how to identify student needs, and we’ll delve into what the best-in-class scholarships do for their recipients. But first, we need to answer the fundamental question at the heart of all philanthropy: why are you giving out scholarships? 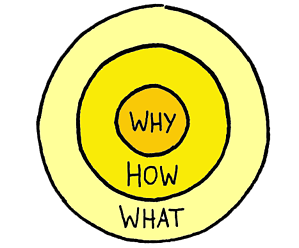 The idea of “starting with why” was popularized in a 2009 TED Talk by leadership consultant Simon Sinek, and it’s a valuable place to begin thinking about creating scholarships with real impact. The “why” of your scholarship program is its purpose, and answers the question of why people should believe and be inspired by your cause. Scholarship providers often state they want to: help students gain access to education; help students complete education; or provide financial support. These may be true, and they’re undoubtedly noble and valuable causes, but they’re also not the kind of inspiring answers that make for a great program. To get at those answers, think about the question differently—not “what is the goal of our scholarship program,” but “what is the purpose of this work in the world?” When you look at your community, your peer group or your own company, what students need help? What motivates you, in particular, to support students? What needs or gaps do you want to fill? What impact do you want to have? By framing the question in terms of your impact on the world and its future, you can ground your scholarship program in terms that drive your work and inspire your stakeholders. And the sky is truly the limit when you start thinking this way. Sometimes, it means recognizing an overlooked need: at Scholarship America, we created the Dream Award specifically to help students who overcame adversity to get into college, but who risk having to drop out due to a lack of funds. Other times, it means leveraging your employees’ passion: thanks to their organization-wide love of science, our 2018 Scholarship America Honors recipients at Genentech developed the Futurelab program to ensure that students in their own hometown could discover and pursue careers in STEM. Whatever you determine, your “why” will help you tailor your program to your strengths and your community’s needs—and that’s why it’s the best place to start. As you can see, a good deal of determining your “why” comes down to figuring out who you want to help, and what their most pressing needs are. However, if you’re not in the education industry (or a parent of a college-bound student), you might not know exactly how to do so. Fortunately, online research of your community and its schools can help point you in the right direction. The U.S. Census American Fact Finder is an outstanding tool for getting an overview of the area you’re thinking of serving. Under “Community Facts,” just enter a state, county, city, town, or zip code and you’ll be privy to all kinds of information about education, income, occupation, ethnicities and more. It may not completely narrow your focus, but it will give you a snapshot to work from. You can also learn about your local schools online, using the National Center for Education Statistics (NCES) databases of public schools and private schools. To quickly assess need levels, you can look for Title 1 designations, and the numbers of free- and reduced-lunch eligible students. How many graduates pursue higher education and what types of programs are they going to? How many will be the first in family to attend college? Do students participate in programs like AVID or summer bridge programs? Do local colleges have TRiO or Upward Bound programs? Do students have access to information on finding, applying and paying for higher education? Once you’ve answered that, it’s time to dive into the nitty-gritty of how your program can best meet that goal. That’ll be the subject of our next post — subscribe now or follow us on Twitter to ensure you don’t miss out on Part 2!